I was already on my way to the East for the Christmas and other celebrations when the authentic news of the merger/acquisition of Diamond Bank with/by Access Bank filled the entire social media. It wasn’t a surprise to me or some others who have been following the developments in the bank. Then I read many of the comments, for and against. I also commented on a few of them, especially on the Facebook page of Diamond Bank employees (past and present). One comment on the Facebook page really hit me hard and it reads as follows, “Change the name to “Diamonds are NOT forever”. Before then others had suggested closing the group titled “Diamonds are Forever” or changing the name to “Access are Acquirers, etc. I immediately thought about other organizations that I proudly belong and our slogans: CASOR – “Once a CASORite, Always a CASORite”; Heriot-Watt University Alumni – “Once Watt, Never Not”. Nothing is going to change that as far as is humanly possible in my head. Why will I drop “Diamonds are Forever”? It is not possible. I graduated late 1998 to early 1999 when Nigeria was transiting from military regime to democracy. We graduated without touching and most times without seeing computers. There were few jobs available and reserved for people who knows people. That was the era when IM was a popular slang in Nigeria, especially SE. There were few scholarships local/overseas that you could apply to do postgraduate studies. When there is any, before you hear about it the deadline has passed. It was all paper-based and there was no internet, and you cannot afford to buy newspapers where the adverts appear. National Bank WAEC aptitude test at PH and interview at Lagos. Arthur Andersen test where only four of us passed and the lengthy interviews, with so much promises that I started ignoring many bank tests, including Diamond bank test at Owerri. FCMB, Platinum Bank, Several other banks, Guinness, Nestle, Lion Of Africa Insurance, First Bank, Accenture, Capital Alliance, National Oil & Chemical Marketing Coy (NOLCHEM – now Conoil), Insight Communications, WAMCO, etc. The list is very long. 95% of aptitude tests passed no employment. By this time suggestions were forthcoming. Visit prayer city for deliverance; you can’t have this kind of result without a job waiting for you. A friend even invited me to follow him to see a man of God who prayed for him to get a bank job. That night I brought out two chairs for God and myself and had an all-night discussion with him. Others of course have concluded that with the course I studied and my class of degree that I was good for nothing than being a lecturer. At some of the interviews they will tell me, “I know you have several job offers and came to try us out and make a choice”. And who said being a lecturer is a bad idea? I packed and went down to UNN, did the necessary documentation and resumed. However, ASUU strike didn’t allow me to work. It wasn’t long and my Oga called me that I have another test with Diamond Bank. He could sense how reluctant I sounded and he urged me to just try. I went for the test at Nigerian Law School where I have become a regular customer. In those our days young graduates dress up on Saturdays and head to Law School uninvited to see if there is an aptitude test they can gatecrash and write. Weekdays we trek around Broad Street and Marina checking offices that are accepting CVs; then we will move down to Victoria Island and continue disturbing security men who by this time dismiss us with the question, “Do you have a minimum of a 2.1?”. Thank God for Nigerian banks; they were majorly the industry that were giving Nigerian graduates opportunities without a connection. The population of candidates in aptitude tests normally will run into thousands, and so it was for this particular Diamond Bank aptitude test. The journey that started with thousands in Law School test center ended up with a list containing only 28 names and I met a GM (Emeka Onwuka) who later became the CEO of the bank in the course of the interviews. Before the ASUU strike was called off I was already at Diamond Bank Training school where I met 49 other interesting trainees popularly known as “BOLOS”. How could I forget the first time I picked a ‘Diamond’ chequebook, drew a cheque and cashed it? The first bag of rice I gave to my mum in December 2001 was from Diamond Bank. I was to get 10 more bags of rice with cartons of groundnut oil in my course of working for the bank. I was a single employee yet the bank allowed my medical cover to be used for my family members when I joined. How can I forget the first time I travelled to Lagos by air in 2002/2003 for a training? It was a Sosoliso aircraft from Enugu airport. The closest I came to that airport was when we took children from my church for an excursion and here I was grabbing my luggage to go board a plane. I have heard stories about turbulence in the air and was secretly afraid. The captain had an Edo name and he just dived into the air or so it seemed to me. I closed my eyes and pretended to be asleep because I am used to flying – imagine. When I opened my eyes I saw small boys running around, going to the lavatory. I had to advise the fear to respect itself. The air travels happened some other time until it became constant and a popular means of travel even for my personal trips. However, I won’t forget the origin. How could I forget that my house at Ohafia was built when I was at Diamond Bank? When I get distress calls from people asking for financial help to pay bills when their wives deliver a baby at a hospital I will remember that thrice Diamond Bank paid for me, from ante-natal to post-natal with superior treatment. I never paid hospital bills and they even pay a little sum to cater for out of pocket drugs that I bought when I wasn’t treated in a hospital (Medical off the shelf). I became a chartered certified accountant (ACCA) while working for the bank. I bought three cars in seven years while working for the bank, that is excluding the one paid for that I never got. During my wedding, they sent two vehicles to convey colleagues and my wedding gifts. For the 10 years plus that I worked there I never knew what was bank charges, chequebook, ATM, transfer charges (local and foreign), name it. I once resigned from the bank, met a brick wall, returned and was taken back as if I never resigned. Few weeks down the line, I was promoted. I worked in a bank that thrived in trust and brotherliness. We called ourselves “Pally”. It doesn’t matter if you are a guy or a lady, from North or South. When we see a cheque with “016” and “203” code we have confidence to even part with cash before debiting. Mine was 016-203-000-9895. We trusted ourselves to a fault that we even shared passwords with our Ogas. I can’t finish talking about “Diamond” in one post. More will come in the future. You may tell me that I worked myself to stupor to earn those benefits, especially for those who knew me in the bank. But I tell you that many Nigerian companies never gave me the chance to work hard. Lastly, what is the percentage of Nigerians who owns a Rolex watch? Yes, the type worn by Tiger Woods. Because of Diamond Bank I am among those very few. And they invited me to that “White Party” after I left the bank to collect that prestigious watch and a Diamond-shaped crystal plaque. This is appreciation Day 18. Thank you so much Diamond Bank for believing in me and giving me the opportunity to serve. Thanks for this simple and constructive write up. 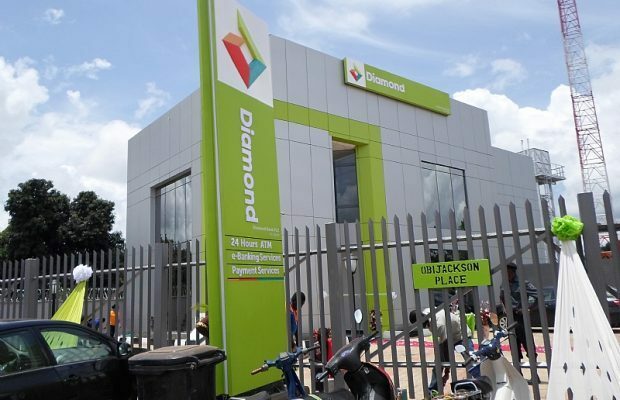 I have a deep personal experience with diamond bank. Diamond bank is the only bank that believes in helping young entrepreneurs. They gave me the opportunity to grow my business with asking me to bring my fathers house, just very simple processes and a level of consistency expected. I will never forget the bank that snowballed me to do international business. The bank has given me loans several times and once am done with repayment, they are gladly oblige another. I have met Master Pascal Dozie and he was an inspiration. Diamond bank is a powerful brand with lots of emotional attachments and I have very personal close experience with the bank. I will never forget diamond as it lives forever in my heart. Very constructive write up. Nothing lasts for ever. As the bank invested in so many youngsters, a lot more laid their lives to see that the bank continued to thrive. It is a shame it all went the way it went. Can we be privileged to know what really happened so that others can learn from the mistakes? Beautiful write up!!! This brought me to tears. Its a beautiful thing to appreciate. I can relate with all that you have said about my Diamond Bank. Indeed Diamond is still forever! Diamond Bank made me who I am today and I will forever be grateful to that. so unfortunate that things have to happened this way.